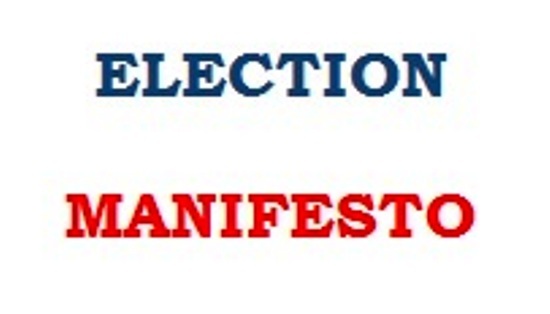 Uncategories Do Election Manifestos have any significance ? A manifesto is a published verbal declaration of the intentions, motives, or views of the issuer, be it an individual, group, political party or government. A manifesto usually accepts a previously published opinion or public consensus and/or promotes a new idea with prescriptive notions for carrying out changes the author believes should be made. It often is political or artistic in nature, but may present an individual's life stance. Manifestos relating to religious belief are generally referred to as creeds – a statement of belief. Manifesto is a policy, proposal or a programme especially one issued before an election by a political party or candidate. In other words, a manifesto is a public statement stating your views or your intention to do something. A manifesto is necessary for political parties, it could be for any work – even for a writer to make his own manifesto - so that one could glean anything from them to inspire you to action which help you to move forward. Since the elections in Punjab and other states have been announced to be scheduled for February 4 and all political parties released their election manifestos with a promise to do something for the welfare of the people during their particular tenure on formation of a government. The people of the state have witnessed the governance of the government and development works in the state during the last two terms in Punjab. It has been seen in the past that the election manifestos are not implemented in toto as promised well before the election. The non-promising issues always come up when the next elections are near and both the local people and leaders of the opposition come forward to start counting on figures the left-out development works of previous government, least bothering to appreciate the works undertaken during their tenure. Thus, they start leveling charges of misleading the people of the state. It has also been seen that the residents in certain areas put up banners with a message to the candidate seeking elections – Don’t visit our colony for seeking vote before completion of pending works. Leaders with false promise may excuse. In fact, a manifesto by a particular party is a public declaration of policy and aims issued before the election but it is not a promise and legal tender like the currency notes – a medium of payment recognized by a legal system to be valid for meeting a financial obligation. Mostly the manifesto is referred to political parties with tall claims of doing ‘this or that’ ensuring of money allocated during the budget for the particular scheme reaches the actual beneficiary at the rural and urban levels. At present only 15% of the allotted amount finally reaches them. The rural population must be made aware that over 85% of the money meant for them for rural development like roads, water supply, lighting, housing etc is being siphoned away by their governing masters. Similarly, the subsidies sanctioned to them for fertilizers, fodder, labour wages, and old age pensions etc are not reaching them and the money allotted for them for such purposes is also dishonestly being siphoned. This is the main cause why they remain poor and the dishonest who have taken their money have become rich. As per western conservative estimates India’s dishonest have stashed away around 1400 billion US dollars of their ill gotten money in safe tax havens in countries like Switzerland, Austria and others. To find out details of such money shall now be possible as these countries are enacting new laws whereby their banks can make full revelations about such deposits. This money is the amount we would spend on the next ten 5 year plans. Another people’s vision has come up that the system can be further improved to by making the election manifestos a part of government agenda if all the political parties in India including regional parties should decide whether they are under UPA or NDA or Third Front or any other alliance well before the elections and declare their prime ministerial candidate before the people which this time has failed even after the announcement of election dates for Punjab. It the right of political parties to decide their alliance and leaders, but is the right of people to know their alliance and the prime ministerial candidate before election. People do not want the negative political tactics such as political horse trading, voting for minister, voting for position, voting for money, voting for favour. People of India want a political transformation. An unbiased and matured social power can lead India to great heights. How can a single political party rule under the constitution of India for the unity, fair governance, religious balance, regional balance and socio-economic balance of India with the democratic principle of equality, freedom and justice in a balance social platform if our political system is under the control of highly influential and interested social groups or religious groups? Frankly speaking – elections come and go every five years and bring promises with them each time; however, there is a lack of focus on most issues of prime concern. In democracy the flow chart of accountability starts from people and end with people and time has come to ask for the leaders who promise in the form of releasing the election manifestos. Gone are the days when the memory of the people used to be very short but now around 65 per cent of the younger generation have become wiser with the happenings around them besides by virtue of education standard and cannot be easily be fooled by the political leaders. The constitution laws which control the ruling system shall not be a well balanced in all circumstance in the passage of time. Unless systematic changes are not made in the ruling frame work of a nation the ruling system shall be a rusted one. India should roll, roll for change. We found that manifestos make sweeping promises with broad ideas mentioned as promises. Manifestos do not talk of the amount of funding required to meet each of the promises and are also silent on the source for creating the funds. The forth coming election in 2017 shall be a turning point only if the election manifestos are made a legal tender like the currency notes, with confirmed proposals to be implemented by tapping the particular sources. The Election Commission should be vested with powers to debar the particular party in the next elections after reviewing the implementation of the manifesto released with promises to put into service, before contesting the elections under the particular political banner.